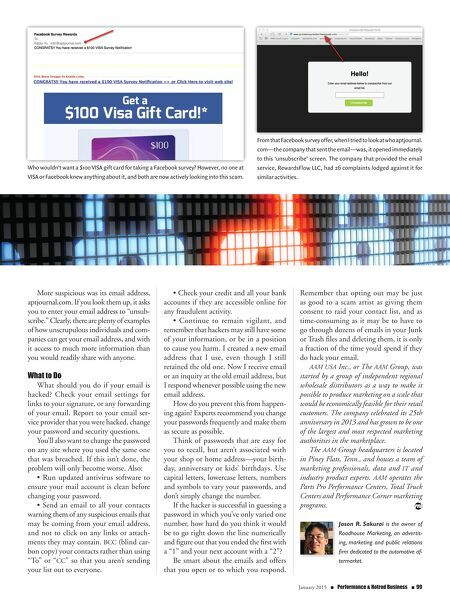 BUSINESS R ecently, tim sent me an article about what to do if your email is hacked. While it contained information that is important to you as a small business owner, it was ironic that the author of that article had an experience similar to my own. Around the beginning of this year, Tim and probably some of you who are reading this received an email from me, in which it said I was stranded in the Philippines, had lost my wallet and was unable to get back to the States. Most disconcerting was that not only was I not in the Philippines nor had I ever been, they had been spammed by some unknown person. Spam email that appears to be coming from you can hurt your business. Your customers have entrusted you with their email addresses and other pertinent information, and whether seen as a threat or little more than a nuisance, it can cause them to delete all forms of electronic communication from you, such as e-newsletters and email blasts that they might otherwise open and act favorably upon. 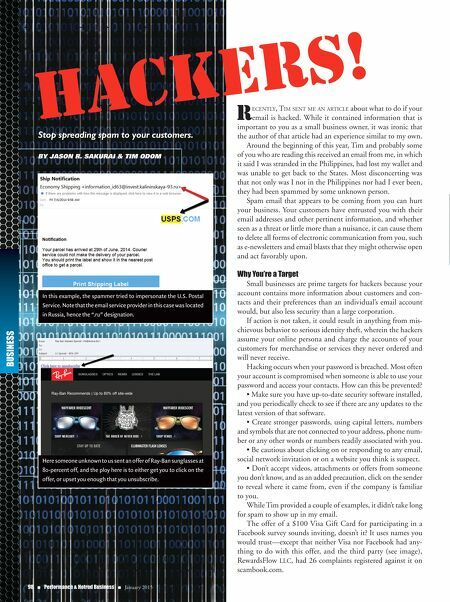 Why You're a Target Small businesses are prime targets for hackers because your account contains more information about customers and con- tacts and their preferences than an individual's email account would, but also less security than a large corporation. If action is not taken, it could result in anything from mis- chievous behavior to serious identity theft, wherein the hackers assume your online persona and charge the accounts of your customers for merchandise or services they never ordered and will never receive. Hacking occurs when your password is breached. Most often your account is compromised when someone is able to use your password and access your contacts. How can this be prevented? • Make sure you have up-to-date security software installed, and you periodically check to see if there are any updates to the latest version of that software. • Create stronger passwords, using capital letters, numbers and symbols that are not connected to your address, phone num- ber or any other words or numbers readily associated with you. • Be cautious about clicking on or responding to any email, social network invitation or on a website you think is suspect. • Don't accept videos, attachments or offers from someone you don't know, and as an added precaution, click on the sender to reveal where it came from, even if the company is familiar to you. While Tim provided a couple of examples, it didn't take long for spam to show up in my email. The offer of a $100 Visa Gift Card for participating in a Facebook survey sounds inviting, doesn't it? It uses names you would trust—except that neither Visa nor Facebook had any- thing to do with this offer, and the third party (see image), RewardsFlow LLC, had 26 complaints registered against it on scambook.com. HACKERS! Stop spreading spam to your customers. By Jason R. sakuRai & Tim odom 98 n Performance & Hotrod Business n January 2015 In this example, the spammer tried to impersonate the U.S. Postal Service. Note that the email service provider in this case was located in Russia, hence the ".ru" designation. Here someone unknown to us sent an offer of Ray-Ban sunglasses at 80-percent off, and the ploy here is to either get you to click on the offer, or upset you enough that you unsubscribe.